1 April 2010, at 8:05a.m. SLOVENIA - This year’s Ross Broiler Flock Awards, jointly organised by Aviagen and their Slovenian customer Perutnina Ptuj, provided the platform to showcase the ever-improving performance of the Ross 308 within Perutnina Ptuj with the presentation of the Ross Broiler Flock Awards. 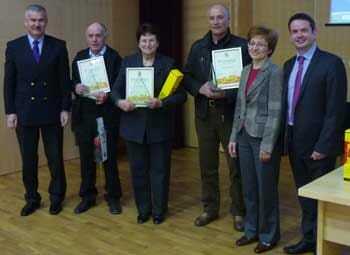 The awards for the best flocks for 2009 were presented to Marija Ozmec, Milan Brodnjak and Maej Riegler. With Perutnina Ptuj also receiving the Central European best PS flock award last year, these awards and the results achieved highlight the outstanding performance of the Ross product at both PS and broiler level. The awards were part of a technical seminar, attended by over 100 broiler farmers from Perutnina Ptuj. Neil Clark, Aviagen's Technical Manager for the region, presented a summary of the results from recent broiler lighting trials in Canada, sponsored by Aviagen. The presentation provided helpful advice to the broiler growers on the optimum lighting programmes to maximise returns whilst ensuring the welfare of the birds is not compromised. Mr Clark commented: "It was a pleasure to be able to present the broiler awards to Marija, Milan and Maej. I am very impressed with their hard work and management experience which demonstrates the genetic potential of the Ross stock and brings out tangible, profitable results for Perutnina Ptuj. This seminar is an annual event in the calendar and provides a great forum to exchange expertise and advice." Milena Valant–Majcen, Perutnina Ptuj’s Director of Live Production, added: "All the broiler growers are very proud of the awards. The awards system stimulates healthy competition between them which is a great help in achieving consistently improved results."